OK. Maybe not that stealthy, but it is pretty sneaky and to doesn’t require baring the entirety of your upper chest or your belly to nurse. I bought I top like this from Motherhood way back, and it is still my favorite Sadly, they don’t seem to make this style anymore. boo hoo. It’s OK, though. I figured out how to make my own and now I am going to share it with you. You can add this type of nursing opening to any (knit top) pattern with an empire waistband. I used a dress in this case, but it will work for a shirt as well. 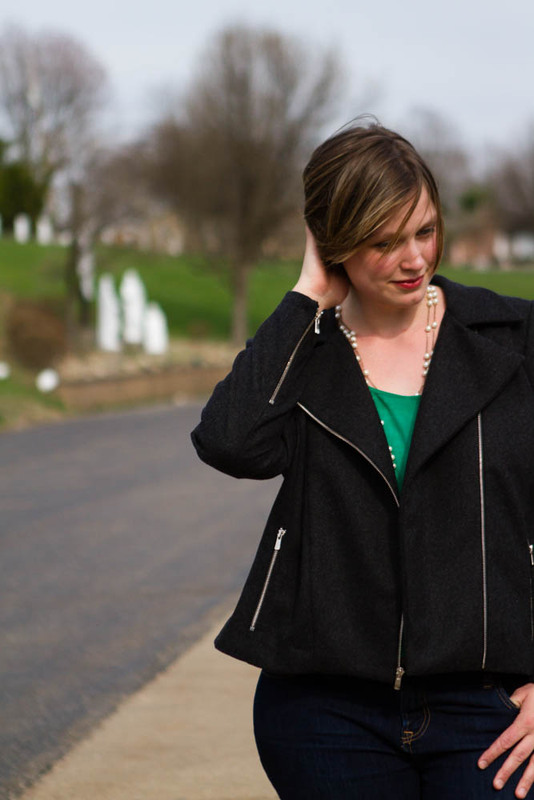 A pattern that has an empire waist and uses a stretch fabric. I used McCall’s 6070. The fabric and notions indicated by the pattern above. 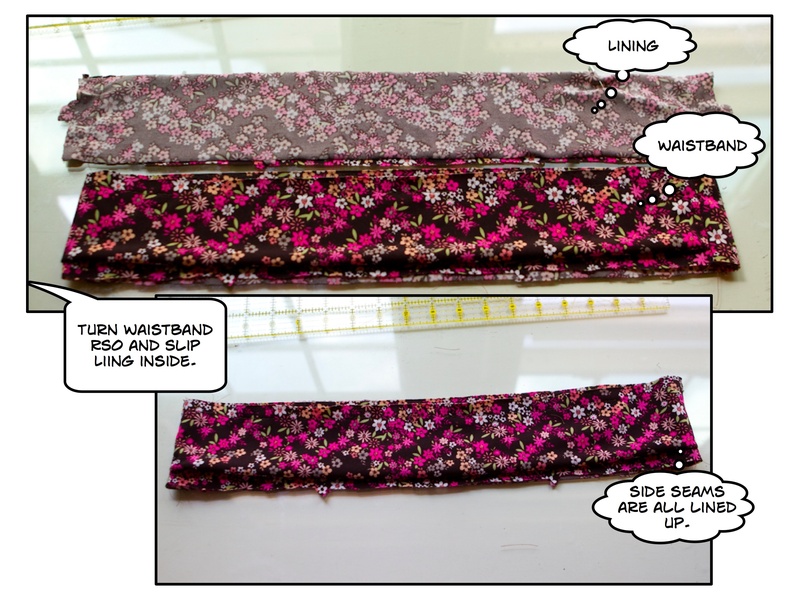 I did not use a serger/overlock on this project because I used some of the seam allowances to make elastic casings. It doesn’t matter if you use a knit because it does fray. I used a narrow “Stretch Stitch” on all seams. 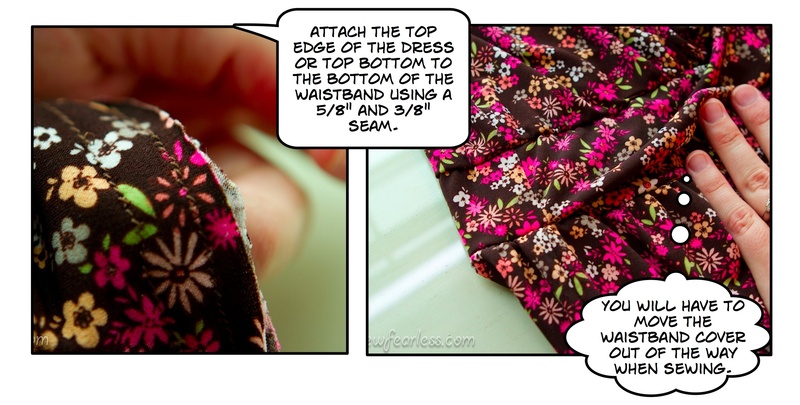 This tutorial assumes a 5/8″ seam. 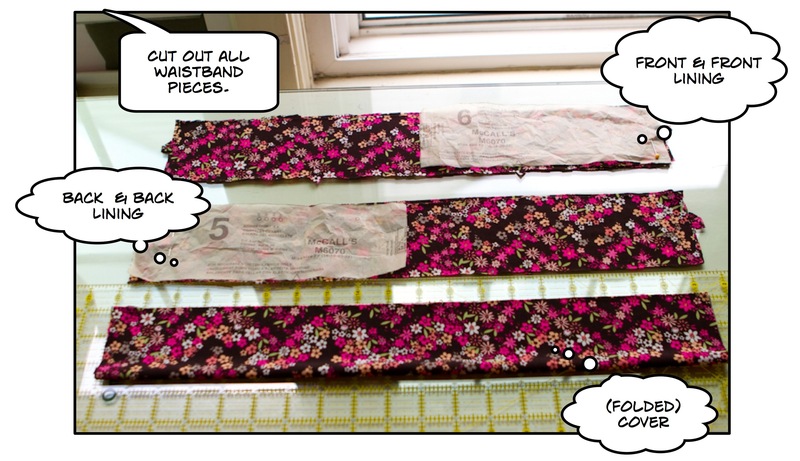 It will be helpful to label your waistband pieces with bits of masking tape or you will get confused. I didn’t and I goofed up because of it. Removing stretch stitches is horribly painful. Learn from my mistake. First, prepare all pieces the same as original pattern directions. M6070 has you cut a second of each waistband piece to use as the lining. You will also have to cut a piece for the waistband cover which conceals the nursing openings. Cut it the same width as the front waistband piece but with a height twice the height of the regular waistband piece. Then add seam allowance. 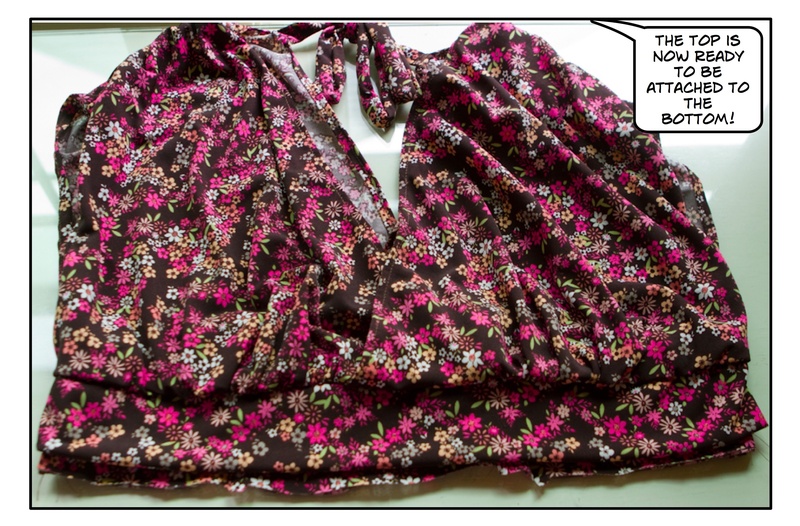 For example: On this dress the waist band is 2.25 inches + a 5/8” seam allowance on top and bottom (3 1/2″ total). The waistband flap is 2 x (2.25” + ⅝”), or 4.75” high. Once all pieces are cut, assemble the bodice according to your pattern directions. To create the waistband cover, fold it in half (wrong sides facing) and baste together along the long edge. The basted edge will be the top edge. Lay the cover on top of the waistband front, lining up the top and side edges. The bottom folded edge of the cover will be 5/8″ from bottom of the waistband front. Lay the waistband back on top of the waistband front and cover right sides facing, lining up side edges. Sew up the side (short) seams, but stop 5/8″ from the top edge. Back-stitch to secure. Sew the lining back and front together in the same way. Turn the waistband right side out and slip the lining inside it. Match side seams. You are going to pin together the front waistband piece to the front lining piece (WRONG sides facing). Keep the waistband cover out-of-the-way we will get to that later. 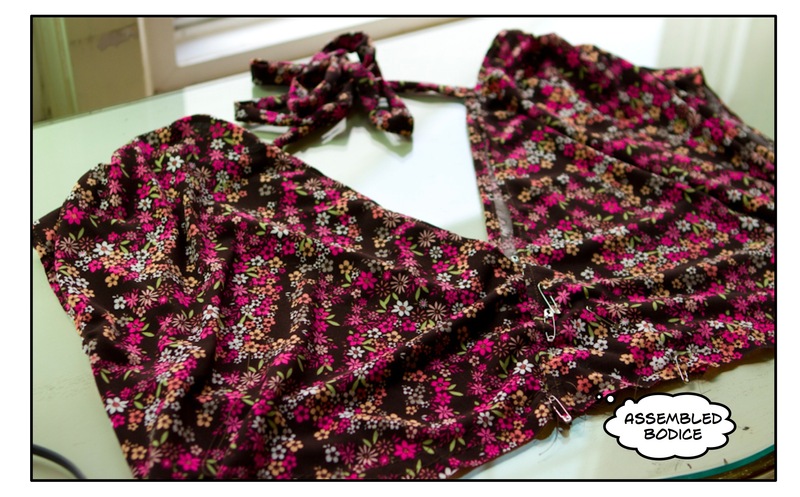 The starting at one side seam and going to the other, sew just those pinned pieces together using a 5/8″ seam allowance. Be sure to reinforce at the beginning and the end. 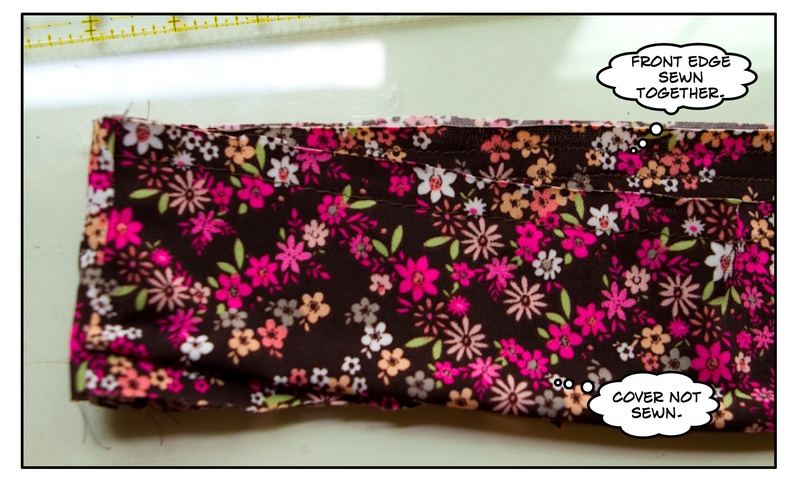 Then, sew it again with a 3/8″ seam allowance to form an elastic casing. Be sure to scoot the cover piece out-of-the-way. We want to keep it free. Now we will baste the bottom edges of the waistband and the lining together (both front and back). Again, keep that cover piece free from the other waistband pieces. Follow your pattern directions to make the upper bodice. Now that we have the waistband assembled we can attach it to the bodice. Turn the waistband right side in and slip the bodice inside. Match up side seams, centers, front to front, back to back, and the bottom edge of the bodice to the top edge of the waistband. The waistband cover will be against the bodice front. Pin the bodice front to the waistband cover. Keep the waistband front (the one that already has the casing sewn into it) free. Pin the bodice back to the waistband back and lining. 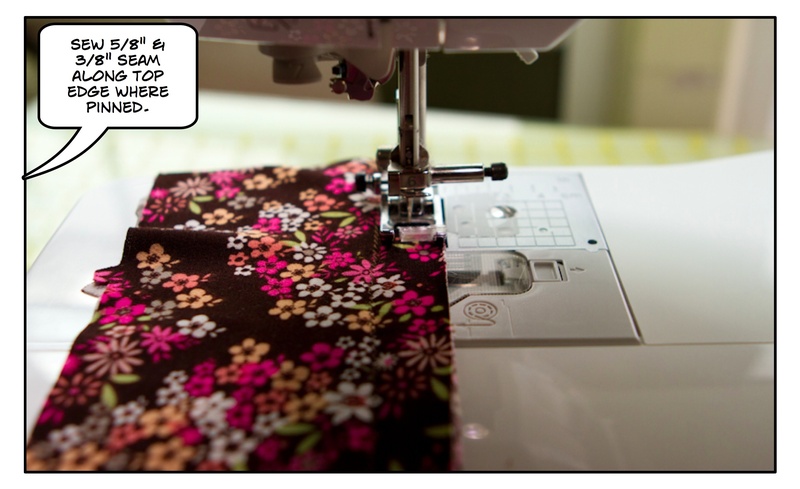 Sew the pinned edges together with a 5/8″ seam allowance. Keep the waistband front out-of-the-way. Remove basting stitches and sew it again using a 3/8″ seam allowance to create an elastic casing. Keep an opening to insert the elastic. You will need to cut a piece of elastic that fits just under your bust. The pattern I was using had a handy-dandy elastic size guide. Then cut a second piece 1/2 the length of the first. Take the shorter piece and insert it into the front waistband casing (NOT the cover). Leave about 1/4″ hanging out of each end and secure it with safety pins. We will the elastic in place after you have tested the fit. Then take the longer elastic piece and insert it into the waistband cover and the waistband back casings. Secure the ends together and try on your bodice. Adjust the elastic as needed. If you are happy with the fit, sew the ends of the long piece of elastic together. 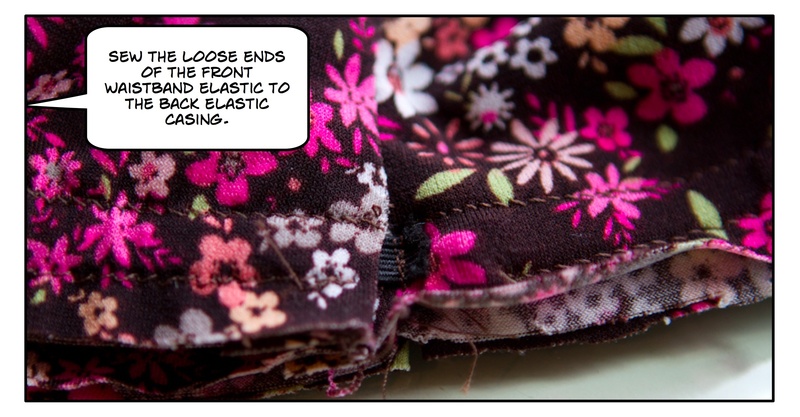 Then sew the loose ends of the short piece of elastic to the back waistband casing. Hey look what you did! You are done with the top of your dress/shirt! Follow your pattern directions to make the dress skirt/shirt bottom. 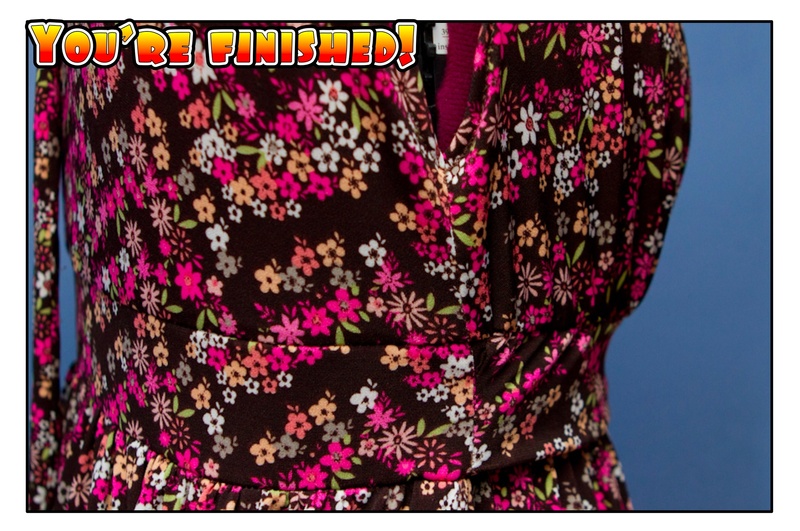 Pin, then sew together the bottom of the bodice to the top of the skirt/shirt bottom. This time keep the waistband cover free. Remove basting stitches, and sew a 3/8″ seam to make another elastic casing (optional). Leave an opening for inserting elastic. Cut a third piece of elastic the same length as the first (long) one. Insert it into the elastic casing you just created. Test fit. Secure ends. 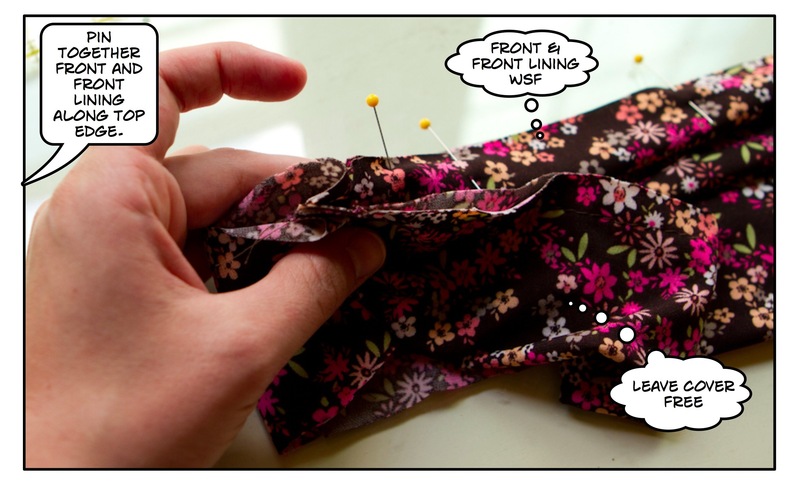 Finish up your garment according to pattern directions (hemming, etc). 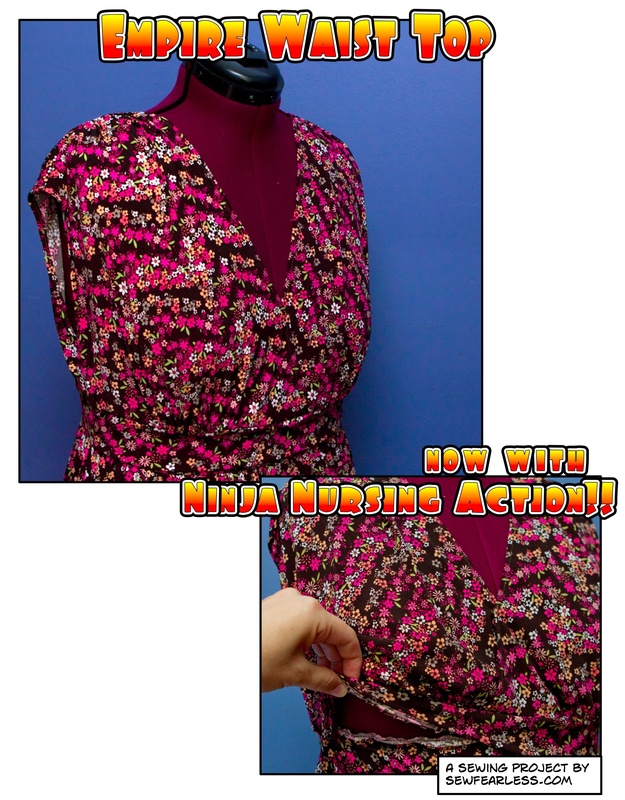 Put on your dress, grab your babe, and start nursing on the sly, Nursing Ninja! 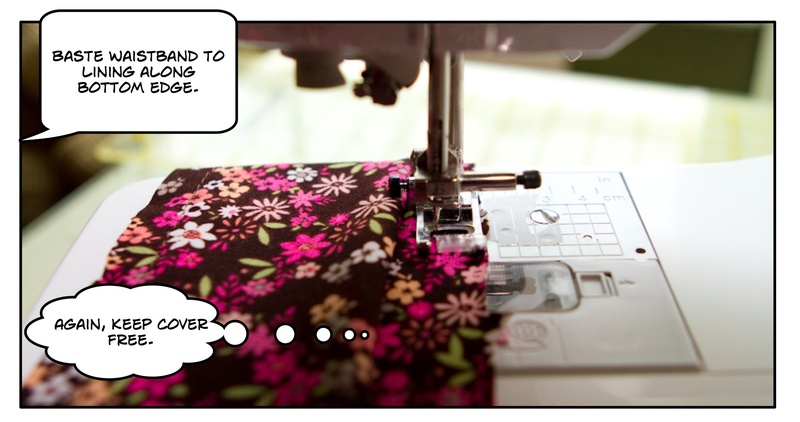 I also love your new banner, with Wonder Woman facing up to the serger. 🙂 And the style of your pictures for the tutorial is very clever! Are you using special software for that, or is it something like Photoshop? Love it! 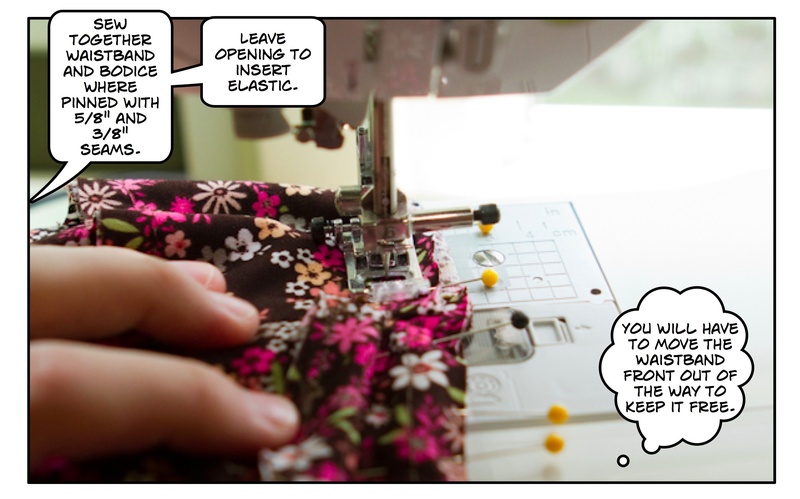 I have never seen anything close to a sewing-tutorial-comic-book before–this is great! And the top is so cute! I am way impressed and so happy for nursing mothers everywhere that you’re expanding their options so stylishly! Very nice! i too had one of these with my first child and passed it along. Then could not find anything quite like it with the others. thank you so much for sharing!!! !What a wonderful job you have done!! both parties throw money away everyday the project sits idle. to ply their trade in recent years. When you learn how to write an essay you can communicate better with your audience.